Choose three random points from the rectangle to form a triangle. What is the probability that the triangle is obtuse? 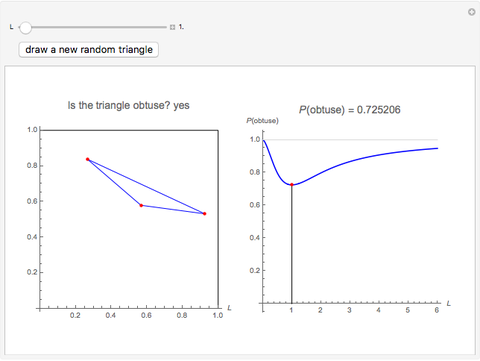 This Demonstration shows random triangles and the probability as a function of . 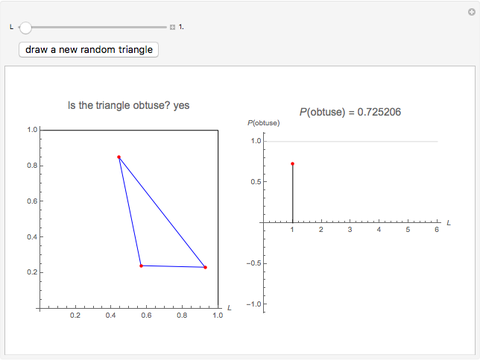 Snapshot 1: In a square, the probability that the random triangle is obtuse is at its lowest value, 0.725, but even this is quite a high value. Approximately only a quarter of the random triangles are not obtuse. 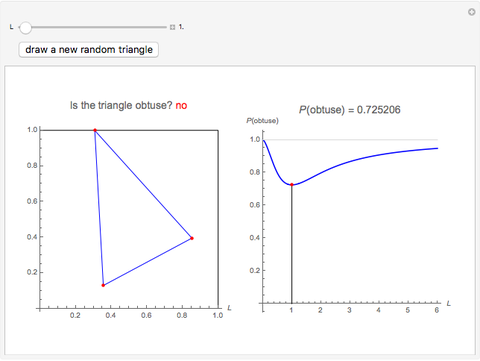 Snapshot 3: For narrower rectangles, the probability that the random triangle is obtuse is even higher. For a rectangle with sides 6 and 1, the probability is 0.948. In 1955, Frank Hawthorne  presented the following problem: "If three points are selected at random in a rectangle , what is the probability that the triangle so determined is obtuse?" The problem turned out to be so difficult that no solutions were obtained for 15 years. In 1970, Eric Langford  solved the problem, moreover for arbitrary rectangles: "Let there be given three points at random in an arbitrary rectangle. What is the probability that the triangle thus formed is obtuse?" The problem is also considered in Nahin [3, pp. 8–11]. If , use the relation . The probability that the triangle is obtuse is at its minimum for . The probabilities are approximately 0.95, 0.99, and 0.999 when is 6.2, 17.1, and 65.3, respectively. F. Hawthorne, Problem E1150, American Mathematical Monthly, 62, 1955, p. 40. E. Langford, "A Problem in Geometric Probability," Mathematics Magazine, 40, pp. 237–244. http://www.maa.org/programs/maa-awards/writing-awards/a-problem-in-geometric-probability. P. J. Nahin, Digital Dice: Computational Solutions to Practical Probability Problems, Princeton, NJ: Princeton University Press, 2008. Heikki Ruskeepää "Obtuse Random Triangles from Three Points in a Rectangle"